Directions: head east on OR-22 E (Santiam Highway) 37 miles. There is a sign marking the name of the community. These buildings are on the left. It’s unclear that Little Sweden, Oregon was much bigger then the two buildings it is now. I can find very little information about Little Sweden, Oregon, it’s origins or it’s rather unique name. 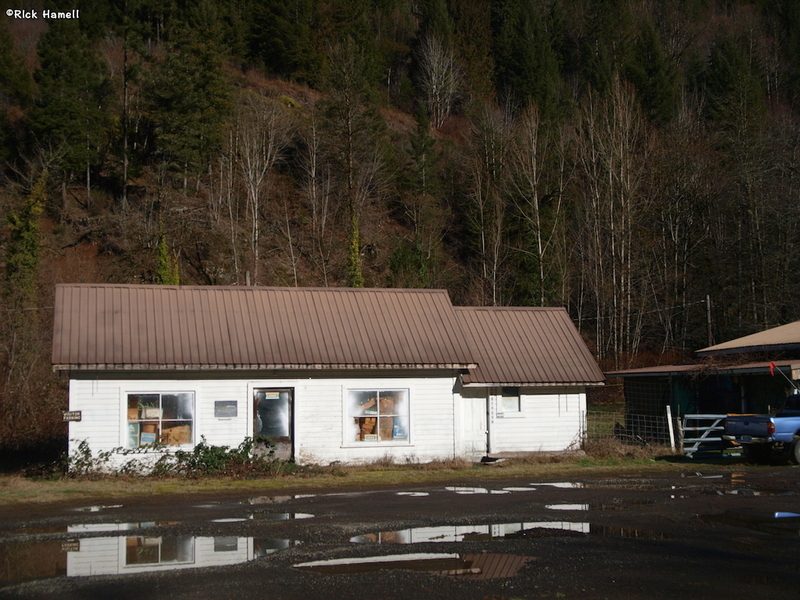 The town is located on the Santiam Highway in Marion County, between Gates, Oregon and Detroit Lake, Oregon. 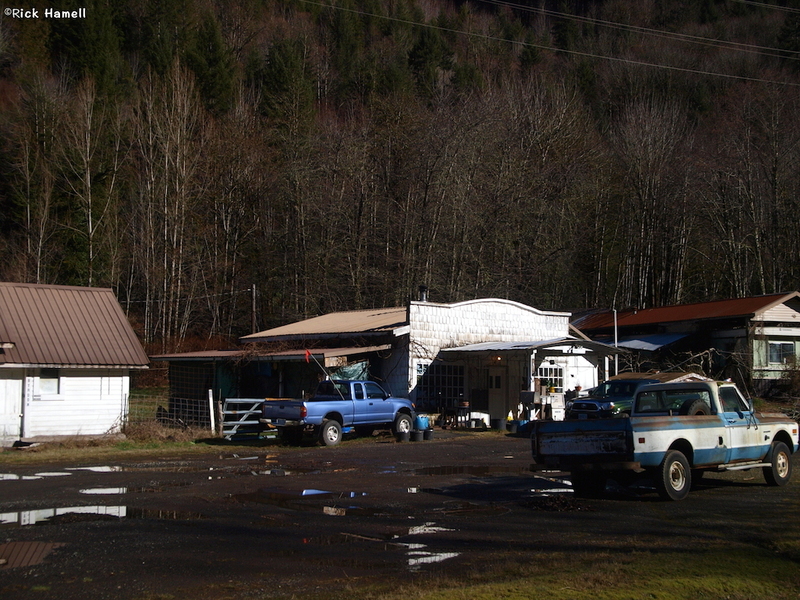 The town never had a post office, but it is obvious that a gas station and possibly a small general store were here at one point. The gas station looks to be a home now, while the general store building looks to be storage. The Geocaching page claims the Nystrom Family homestead here some time in the mid 1800’s. On October 3, 1890, a post office opened here. It was named after a stand of green timber just north of town near Rocky Top. Lewis McArthur states that a saw mill was near the post office. Doctor John D. Montgomery was the first of four post masters for the town. The office closed May 1, 1896 to nearby Niagara Oregon. Sometime in the early 1900’s the Nystrom Family installed a Pelton Wheel Generator in the town for electricity generation. Does anyone have any more information about the town? I’d be interested in learning much more! Please leave comments below. I heard that the man who owned the store/gas station was murdered. They caught him and he is now in prison. I heard he was never caught? Where did you get your info? Ive talked to the people who live there and they said the killer was caught and is serving life. My great uncle Oscar Nystrom was killed in the home/gas station that he operated for many years. I believe he was shot and then the building was set on fire although the fire didn’t destroy the building. The suspect was caught and convicted. The spot was given the name Little Sweden because the Nystrom family were Swedish immigrants, they came to Oregon from Minnesota, where they had first settled from Sweden. Its a sad story…Oscar was murdered for a tank of gas.The killers or killer are doing life in the Oregon state pen.Mrs Nystrom lives in a beautiful log home just left of the old gas station.You can also see an old saw mill to the right of the property.The river across from their property is a very beautiful stretch of nature.God bless Little Sweden,God Bless Mrs. Nystrom. Does anyone know about the Native Americans who lived in Little Sweden around 1910? I just found info that a relative, Lewis Knighton was born here in 1909/1910. I’m doing genealogy research on my family so any help would be greatly appreciated. The last owner was shot , it was a gas station and home combo. Honk anytime he’d come out and get your gas. Very depressing act of violence, still a shock. did you have any experience seeing any ghosts because I sure would like to know very much.